After an obligatory photo at the Road Conditions sign, we were off. 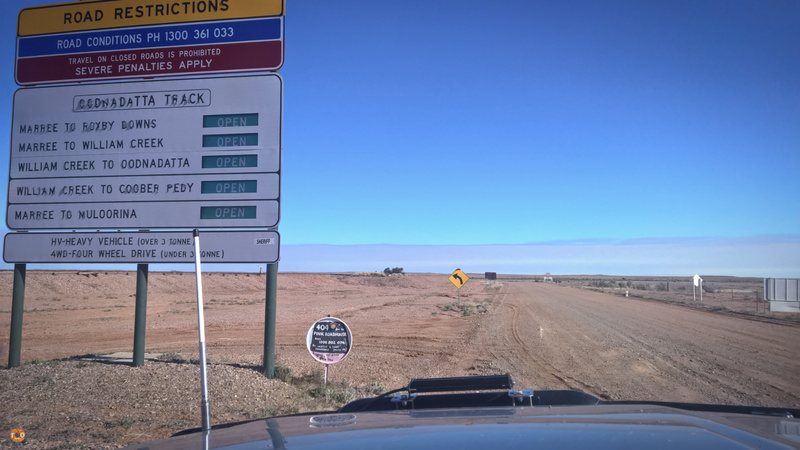 The famed Oodnadatta Track open before us. Progress was stilted. 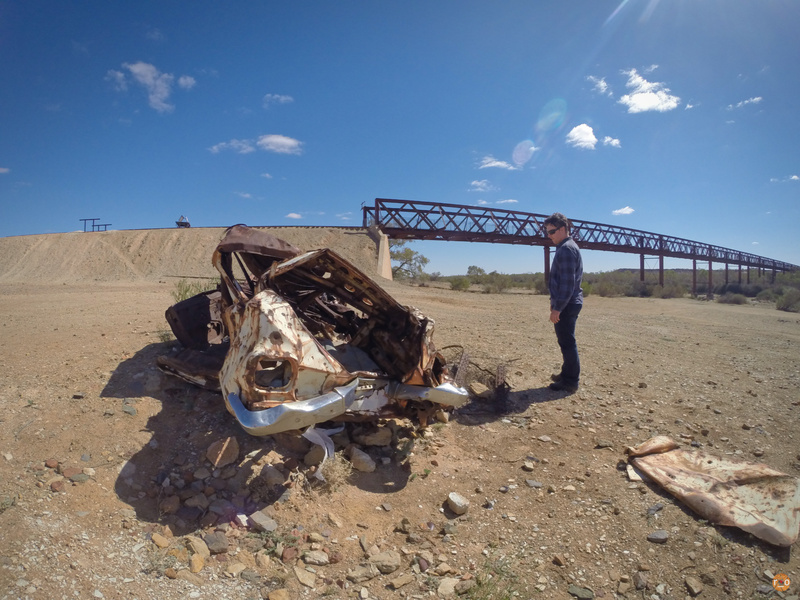 This track is, without a better word, littered with memorabilia. From the sentimental to the strange. Railway sidings held more mystery and romance than that of the scrapyard sculptures, but then we hadn’t researched their origin story. The day started sunny, but soon grew glarey with cloud. Casting a matte hew over the landscape. The red gibbers were congealed rather than glinting. 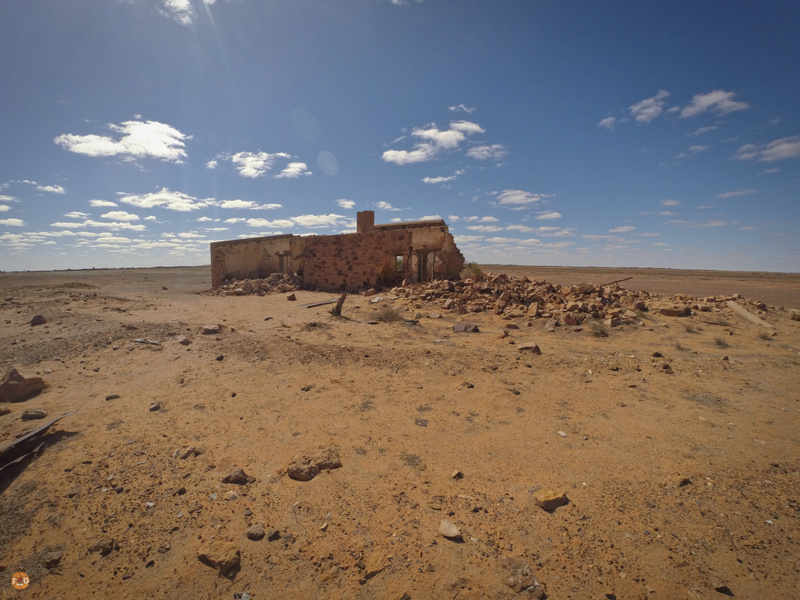 The ruins of the Ghan’s route were dotted along the way. 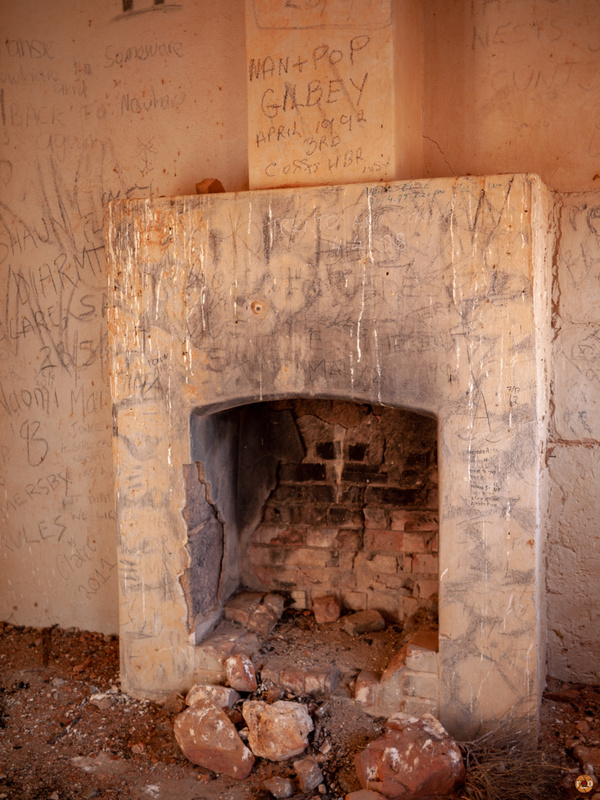 We found evidence of boozey campfires at most, modern graffiti and aluminium collected around a sooty stain inside or against the building. Older rusted tin and scrap roofing littered the surrounds. The buildings themselves, stoic and golden. Some still claimed their timber. We only recall one other traveller, mostly because their royal carriage was, well, royal. A 200 Series with all of the trimmings, towing a double axle Kimberly eKruiser. It looked huge, even in this landscape. Always slightly ahead of us, they were exploring the same establishments, but the romance of discovery was kept alive in their advanced timing. We came up on Coward Springs quicker than we imagined. There is a museum here which is well worth a quiet ponder. The floorboards creaking underfoot which each slow step. The artesian bath is very sophisticated and inviting. A hardwood deck and blue water, tepid to the touch awaits. 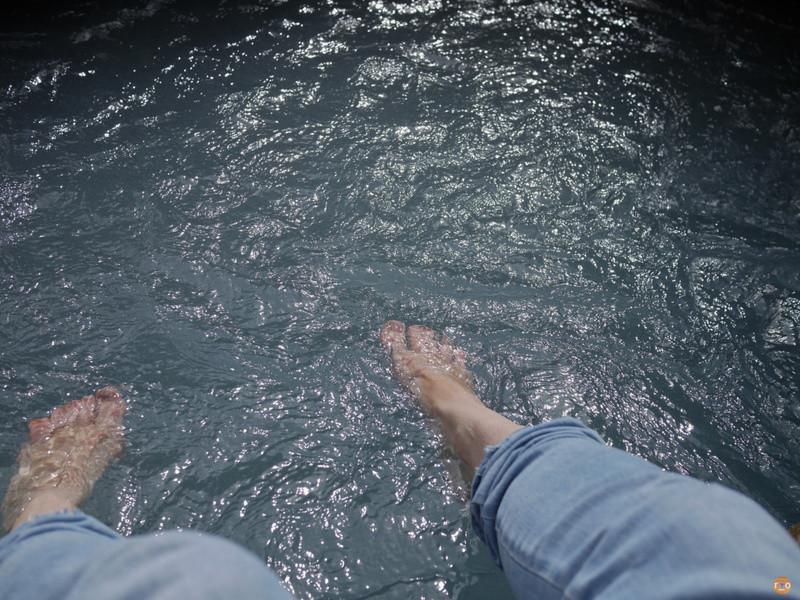 We soaked our feet, waving at the friendly flies. 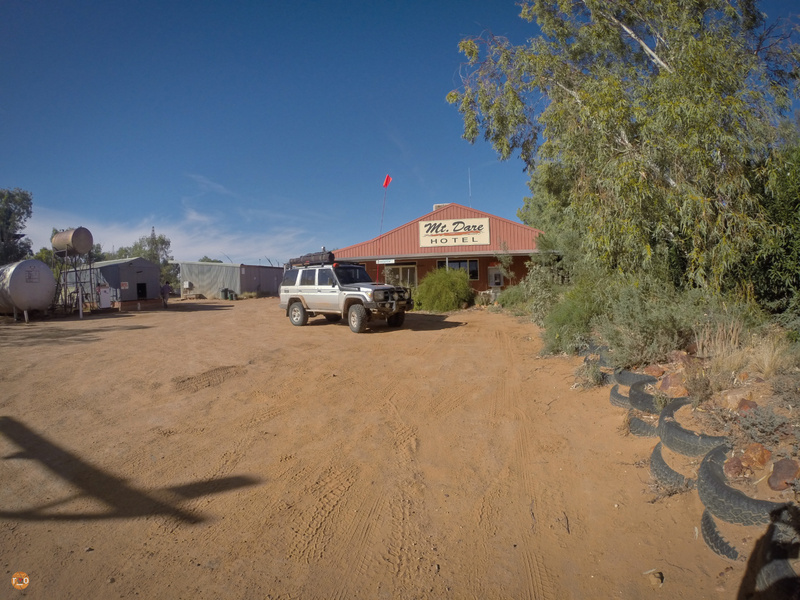 The camping facility was excellent, donkey showers, private sort of camping allocations by thick mallee shrub. The layout suggested its popularity but on our visit, it was empty. Regrettably, we had arrived early in the day and still feeling that itch to drive on, we both agreed, this looked a glamping oasis worth a return. Before long, signs of the salt lake of fame and fervour start peaking from the sideline. 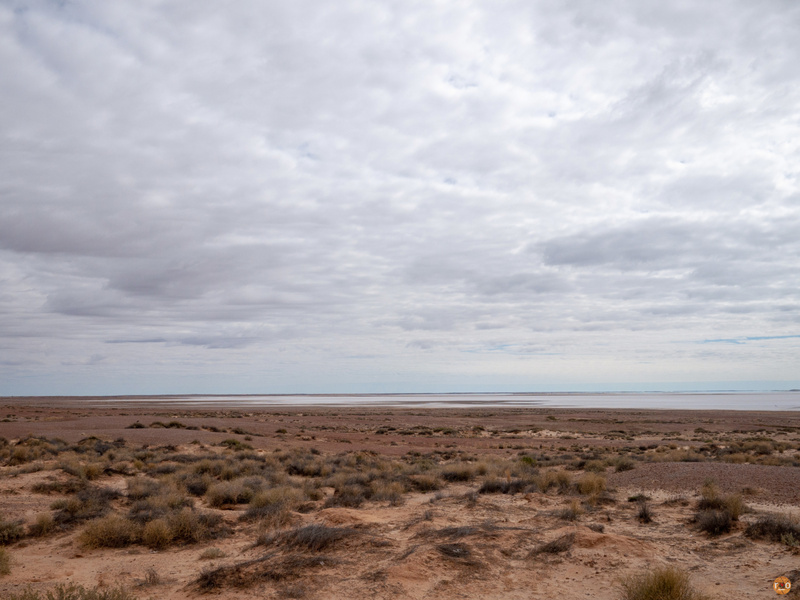 Southern Lake Eyre. A white wonderland of mystery. Natural marvels like this always get us excited, especially one so alien to what we had seen before. We stopped a few times, prematurely trying to stare out at the lake from this distance. 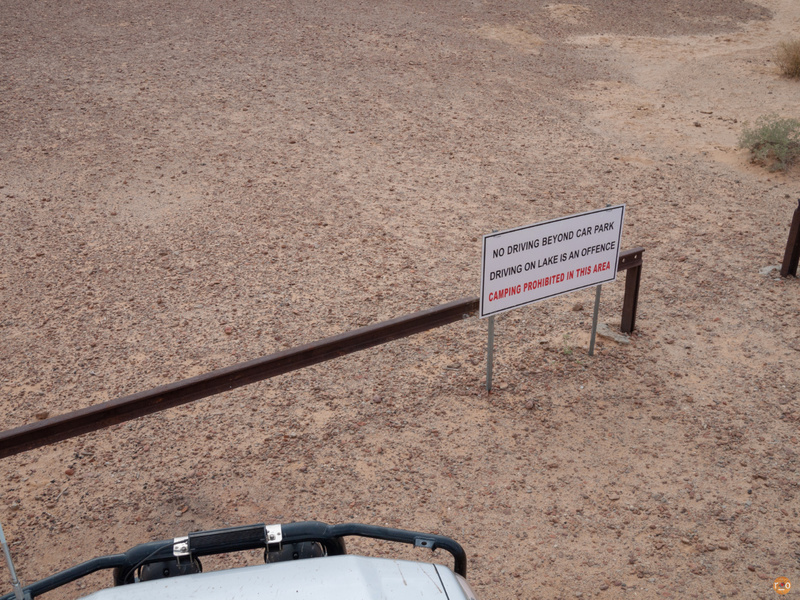 Eventually, an established lookout carpark invited us in properly. Getting up on the roof to see more, Under the high cloud, it didn’t shimmer or glint. The off-white abyss that beckoned, its danger veiled in the silence. I understood the meaning of the several signs that warned not to proceed past their mark. As tempting as it would be for me to just start walking, others would surely love to drive. But the sheer immenseness looked to swallow you whole. Not to mention whatever surface quality was awaiting your heavy footsteps, or tyre track. Beautifully monochromatic in a way. We resumed our northbound heading. Occasionally, maybe less than one hand, a vehicle passed us, southbound. 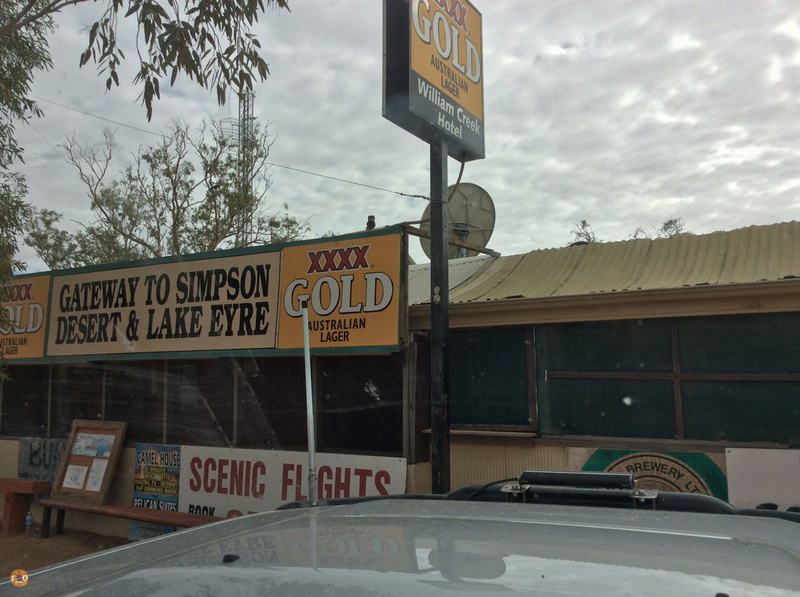 William Creek boasts a Hotel and an airstrip. Anything else was retired to the dust an unknown time ago. The outdoor museum of space and agricultural junk has small plaques for explanation. Everything is painted in beige dust and glare. The Hotel, bursts so much colour and detail when you open the door, it takes a while for your eyes to adjust. In tradition, its walls, ceiling, any surface, are plastered with photos, hats and memorabilia of time and folk passed. There was a raucous amount of noise coming from behind the bar, to our ears anyway. 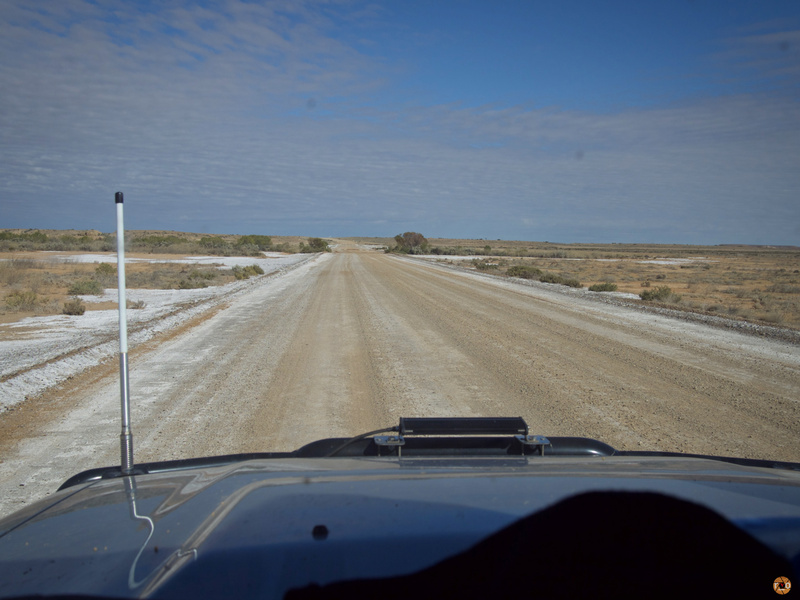 We had had only the gravel roar of tyres, and buzz of flies since leaving Marree. 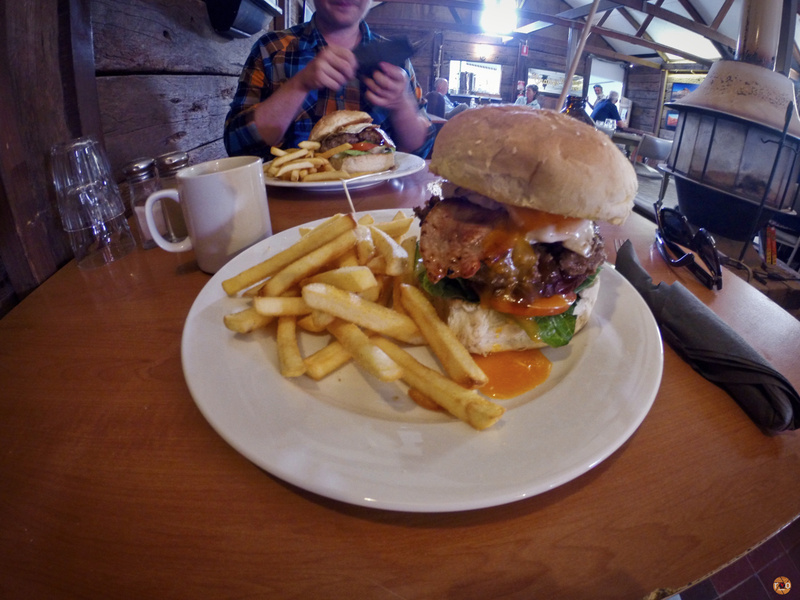 Ordering drinks and their famed burger, we claimed our own wood in the large dining area. A busload of tourers were the source of the frivolity. Fed and watered, we returned to the sanctity of the LandCruiser and headed out, this time, East. We were looking for Halligan Bay. The road is almost immediately awful. Corrugated and washed out. Our progress was stilted, aiming for a comfortable speed but throwing out the anchor for the next hazard. The view however, is mind blowing. We were transformed to a strange planet, straight out of Kirk’s Star Trek. Eggplant purple, almost black looking gibbers. And a flat mustard expanse for as far as the eye can see. 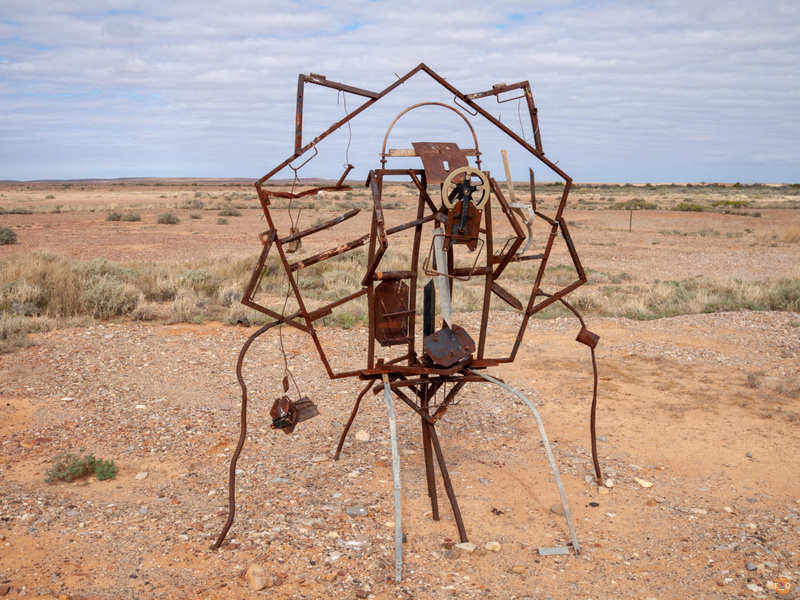 After the interchangeable red and beige of the Oodnadatta, this was just odd. The quality of the track however, kept our attention. It was woeful. We passed cows, who impassively watched us rattle by. After an age, we caught up to a grader. After a pause, we laughed. The best was behind us. 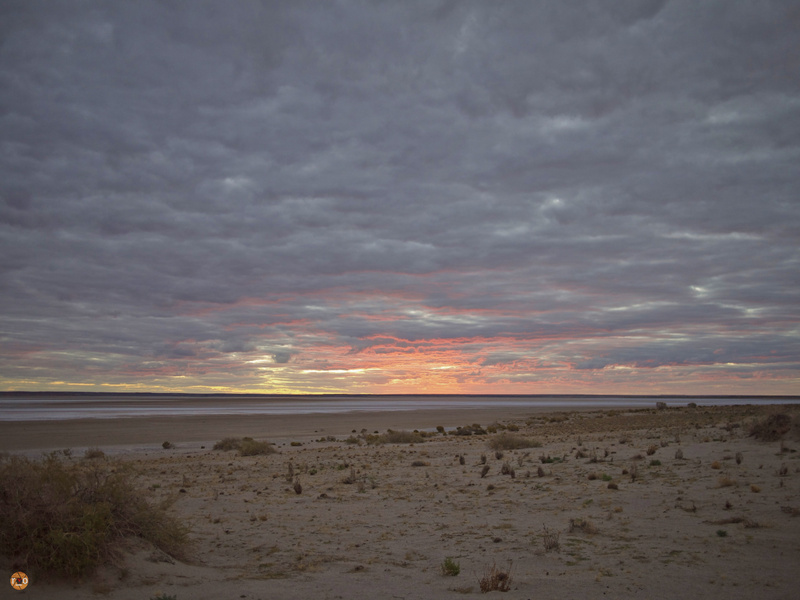 Hitting the sand of the extended shore was like hopping off of the bitumen, onto a concrete footpath with your skates on. Smooth like oiled smoke. We nervously made our way around to the designated camping area, looking for a spot, just far enough away from the amenities. 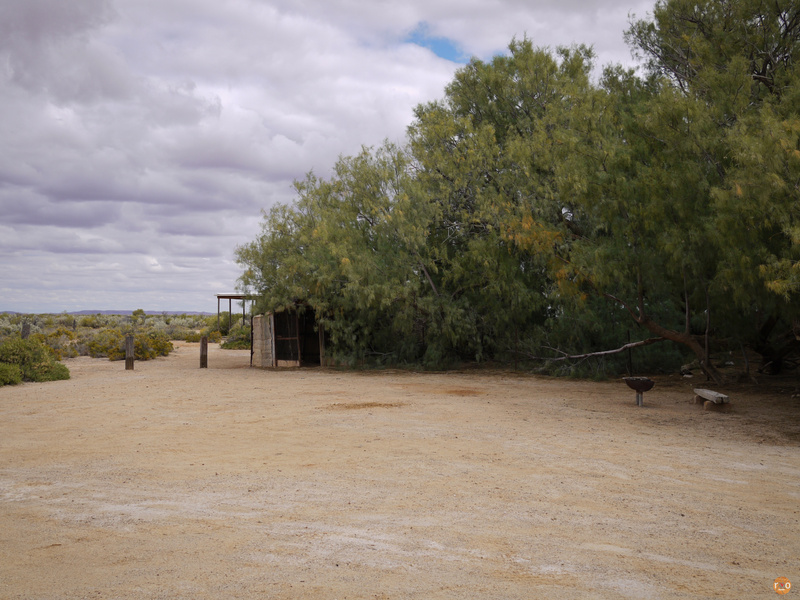 We saw only low salt bush for shelter, there was no shade. But then, there was no sun. On this planet, the thick stratosphere had whited out the sky. Fluorescent light without shadow filled the open spaces. Not wanting to get bogged after surviving the track in, we quickly chose our spot. We were both keen to see this Lake on foot, up close. We walked out. And kept walking. As I am sure everyone does, walk and walk, turn and look back, walk some more. The expanse is almost too much for your mind to believe, you feel a need to remove yourself from the shoreline to properly confirm its validity. 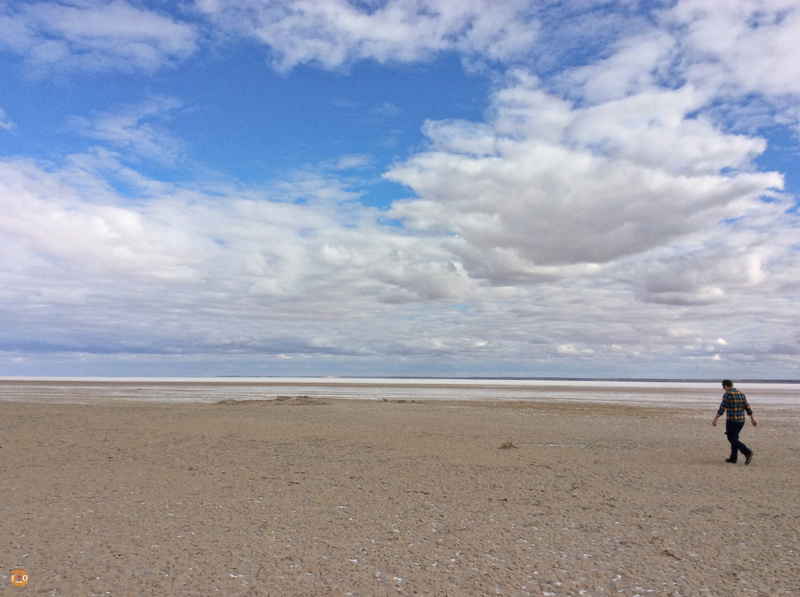 Like a tide years out, the Lake is white with crunching salt. The horizon is unconvincing. Especially on a cloudy day. Looking back towards camp, we can create one ourselves by following a natural line. 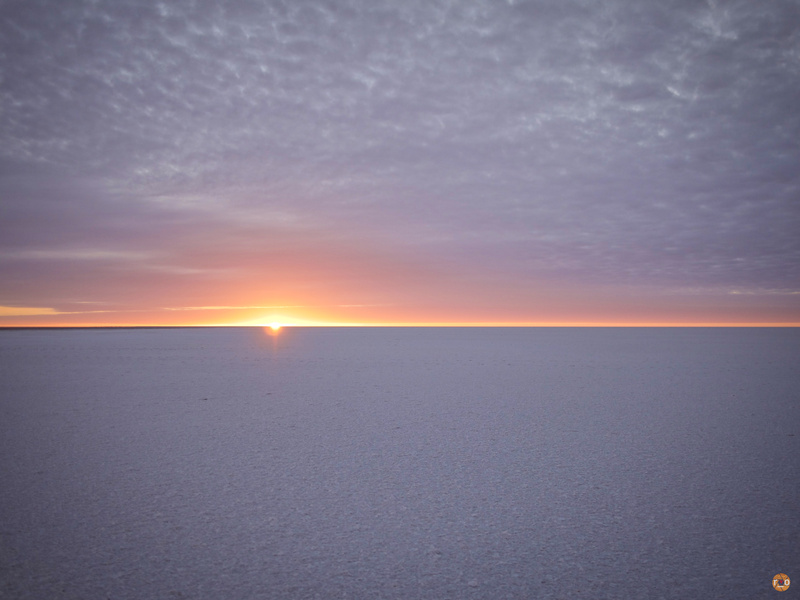 Once I was satisfied I was inside the mirage, looking about and feeling the salted floor in quiet awe. Only the breeze in your ears. This was as close to nothingness I had been. Similar to sitting on the bottom of an olympic pool. It’s beautiful. 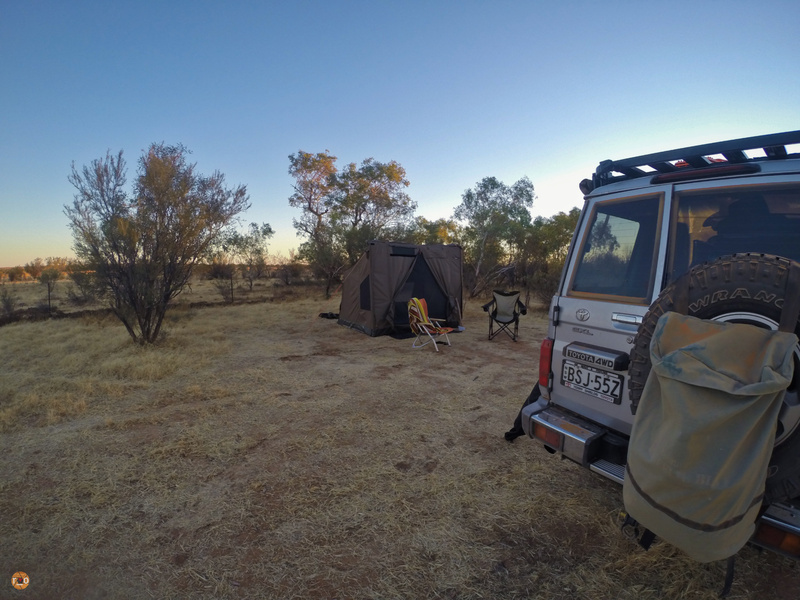 Back at camp, we staked the tent close to the LandCruiser. A breeze had picked up. Like the whole area, the toilet was clean, dry. After sitting quietly, our chairs in the sand we noticed the smallest of birds flitting between the strange looking bushes. 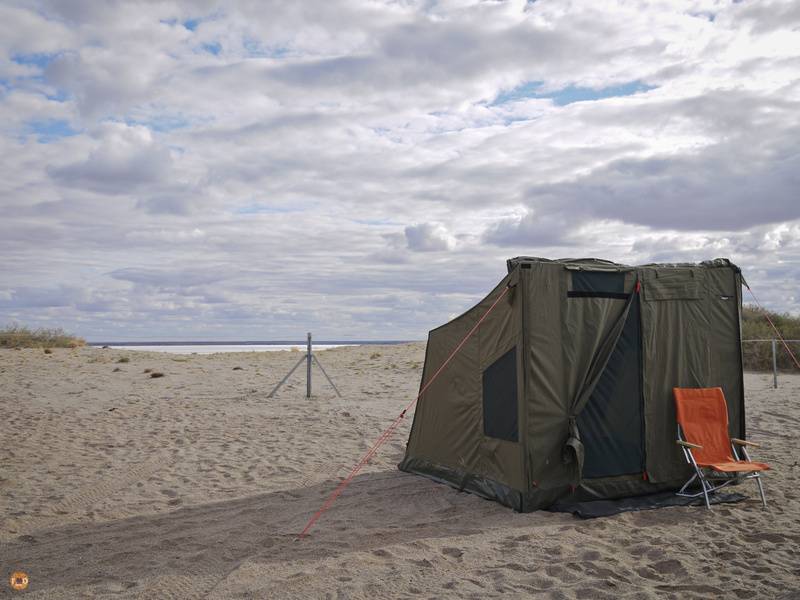 After the sun had dropped, the wind picked up and we retired into the Oztent early. Snuggled in and watching something on the iPad. 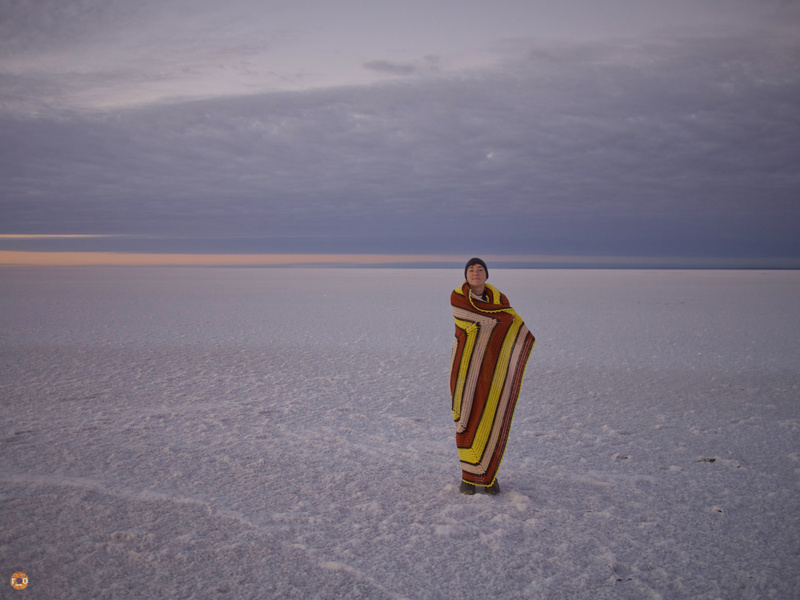 The cool wind buffeted the tent walls all night but the sandy floor was soft and comfortable, between these two we slept well enough. I had set an alarm, wanting to see the dawn. And so, in the coldest morning hours, the alarm on my phone rang out like a siren. Wrapped in my crochet blanket, boots and beanie we crunched out onto the Lake. The horizon was easier to define now. It was aglow. It was on fire. Hypnotised with the simplicity. We managed a few photos. Our distant, solitary neighbour was gone, but they had left their rubbish in the toilet. A huge garbage bag overflowing with long life milk cartons. Breaking our fasts and camp was a slow but simple affair. David checked over the LandCruiser a little. The road felt as rough as it had yesterday, until the graded section where it felt marginally, perhaps only psychologically better. We topped up our fuel at William Creek and resumed North again. Stopping for ruins, and other excuses, we wound our way out of the cloud cover. The road environmentally deviating, but always northbound. 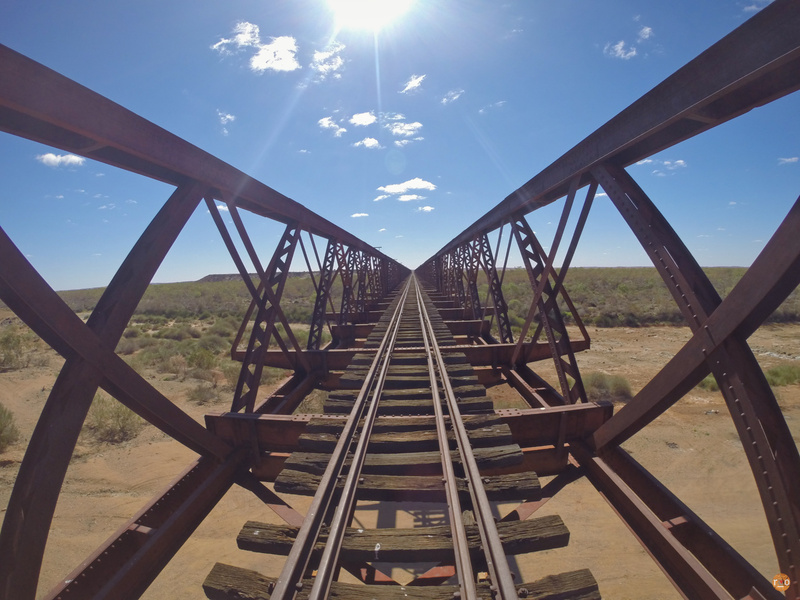 The Algebuckina Bridge sticks out like most man-made structures. 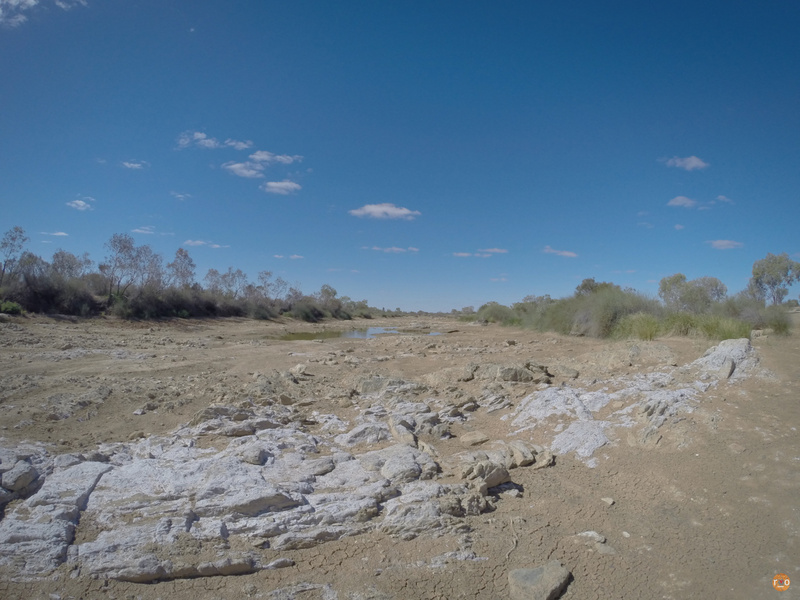 Looming thirty metres across a wide but dry Neales River. Evidence of camping was all around. It’s difficult to imagine, but water lapped at the sleepers in 1974. It was warm and dry on our visit and the gauge was confirmed by the friendly energy of flies. 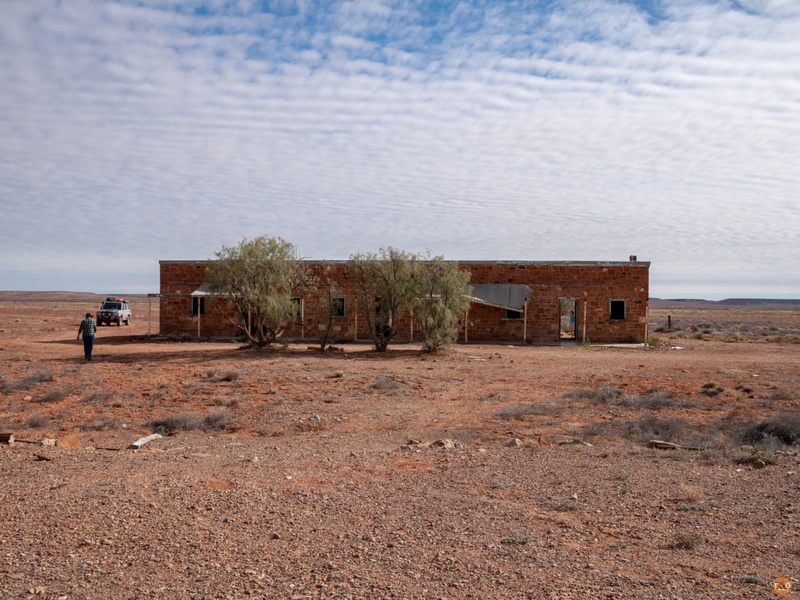 Handpainted signs and the famed pink Roadhouse welcome you to Oodnadatta. There were a few kids marching with purpose here and there. And an old fella playing the guitar in the shade. We ventured in. The Roadhouse inside is huge and naturally lit. And plentiful. Stocked well with vegetables and meat as well as groceries. We ordered their Oodnaburger and watched the news on the TV. Afterwards, we wandered around the township but it appeared as though the Caravan Park behind the Roadhouse was the only option of accommodation. 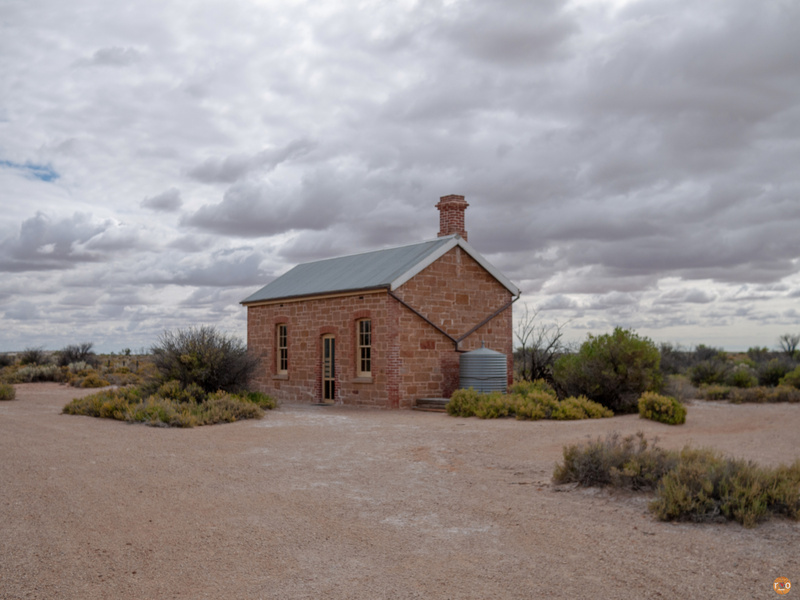 Despite the entire town appearing boarded up with iron and high fences, we decided against another hour or more of driving for a bush or station camp. Returning, we paid for a night. After staking the Oztent we had a shower. Opting for dinner at the Roadhouse we chatted with our host and ourselves before returning to the tent. Unfortunately, another traveller checked into the cabin nearby and ran the rattling air-conditioner all night. Feeling every decible of town camping, we slept lightly and were up with the sun for breakfast. We retrieved a mudmap of the sand driving circuit on the outskirts of town and after an age, found it. Deflating the tyres we had some fun on the soft red sand. A taste of what was to come. Back in town, we watched what looked like a dozen kids load up a 60 Series LandCruiser with snacks and camping gear from the Roadhouse. In their chaos, they neglected to close the tailgate before taking off. Full of energy, a couple of kids climbed out, retrieved the fallen goods, before the 60 was again hurtling down the road, full of arms, legs and giggles. 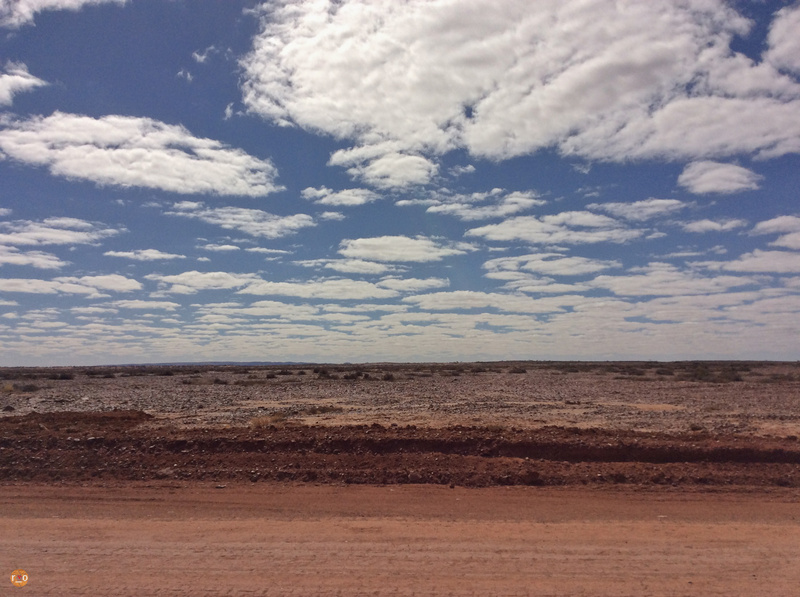 The road north of Oodnadatta turns distinctly red. And exciting. We had run out of towns for a while. 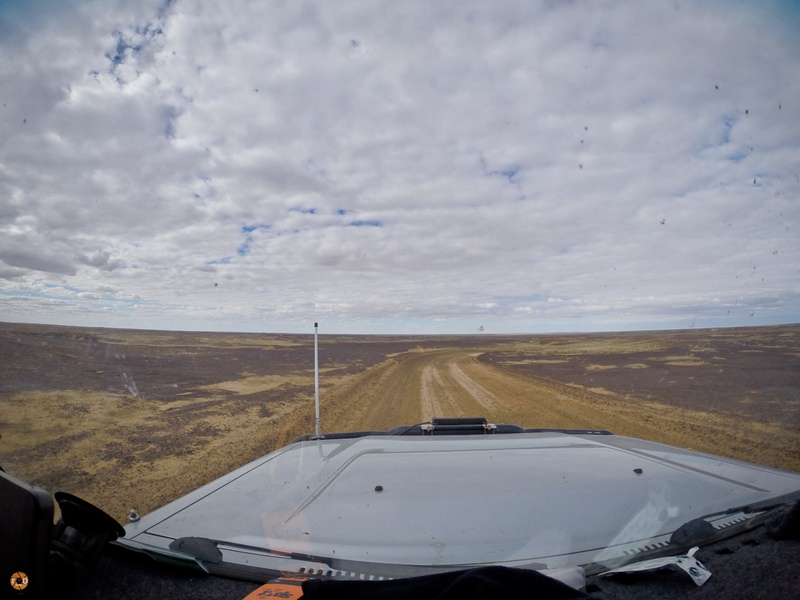 Once leaving the Oodnadatta Track the terrain changes again. Sandy patches smooth out the otherwise fairly rough travel. We stopped at a creek crossing for lunch, managing to get into some soft, deep sand. It was hot but the shade of the large trees painted a beautiful setting. 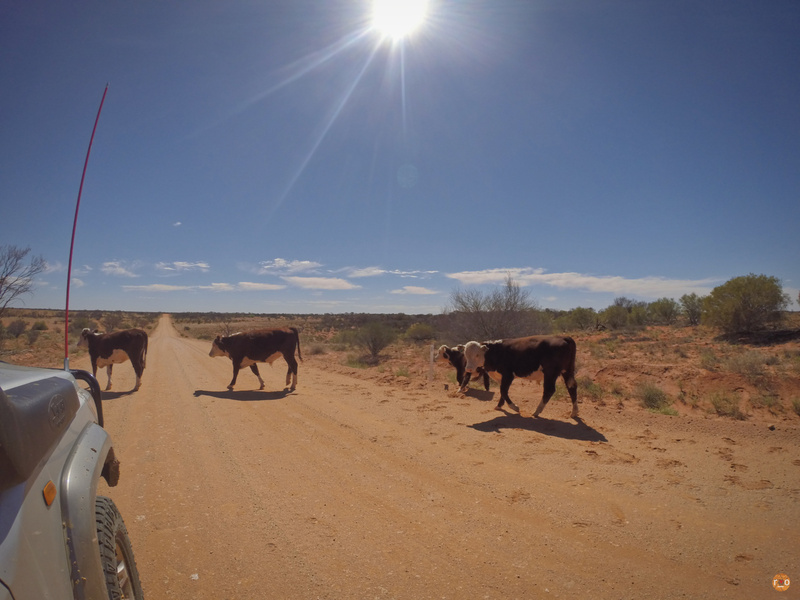 Fat cattle kept us company along the way. Heading towards Hamilton Station, we looked out for Mount Sarah and Mount Rebecca. 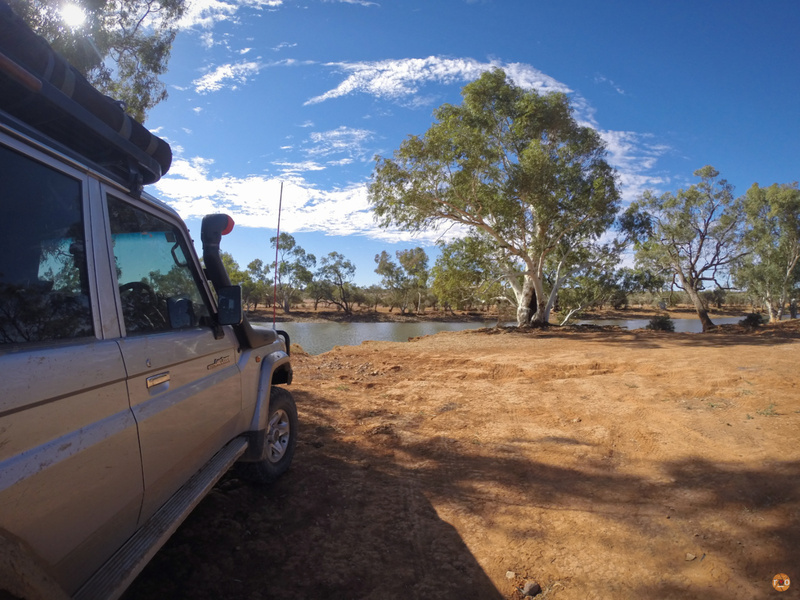 Further on, Eringa Waterhole, in hindsight would have made a perfect spot for an overnight stay. The birdlife and water created a peaceful, shady oasis. From here the road towards Bloods Creek stretches out, but deteriorates. Now heading easterly towards Mount Dare instead of away. 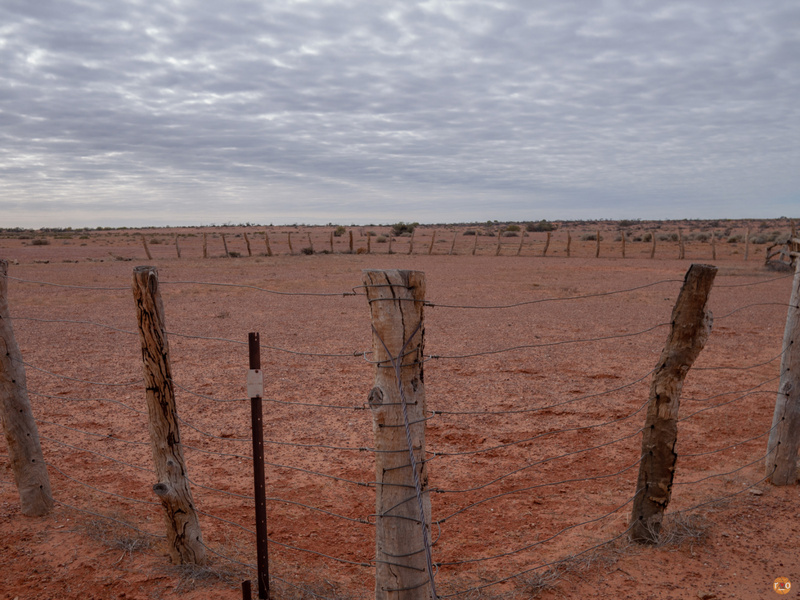 Our progress so far had surprised us a little, but now we slowed as much as the corrugations would let us. Some of the roughest terrain we had travelled so far, if it wasn’t corrugated, the rocks ground away at our energy. Now in the National Park, sage green signage describing the surrounding lands and features. 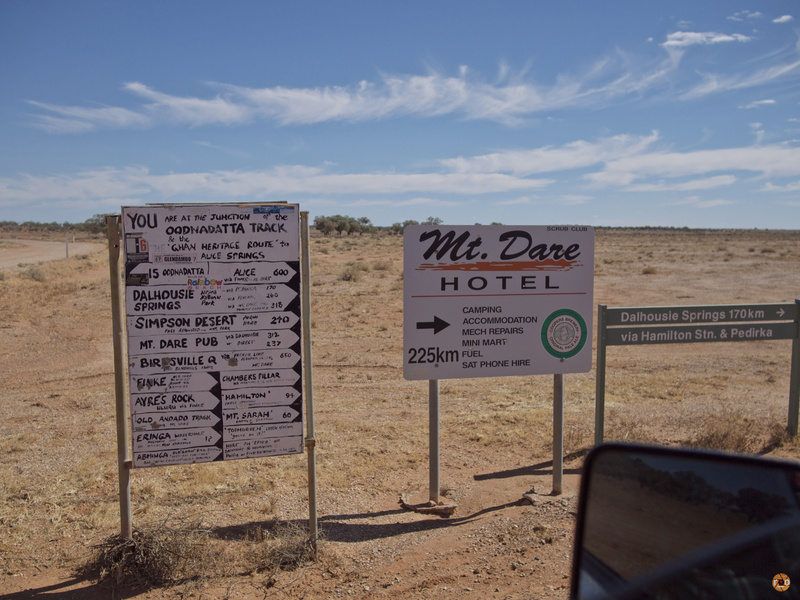 After an age however, we found ourselves at the gate of Mount Dare Station. Staggering from the LandCruiser, a quiet shed in the long shadow of the setting sun greeted us. 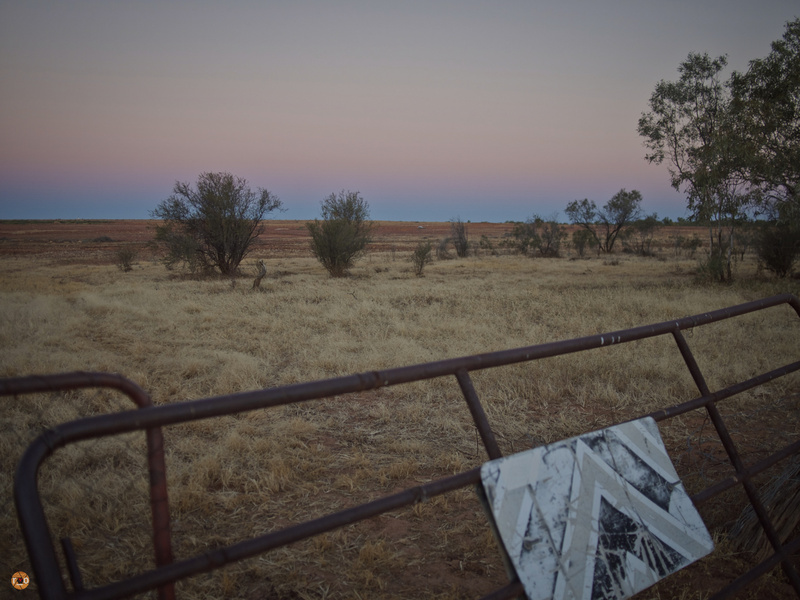 With no-one else about, and no desire to drive a moment longer, we heeded the Hotel door’s sign and closed it against dingos and flies behind us. Varnished timber flooded our vision and the tall ceiling hosted a handful of T-shirts and signage, but pretty bare compared to the older outback Hotels we had visited. A friendly face appeared and we gravitated to the bar for a lean and a yarn. He was working off his broken Navara. A trip to Dalhousie Springs had cracked his radiator and cylinder head from the consequential overheating. After our day, we were nervously unsurprised. But, we would learn more of that later. 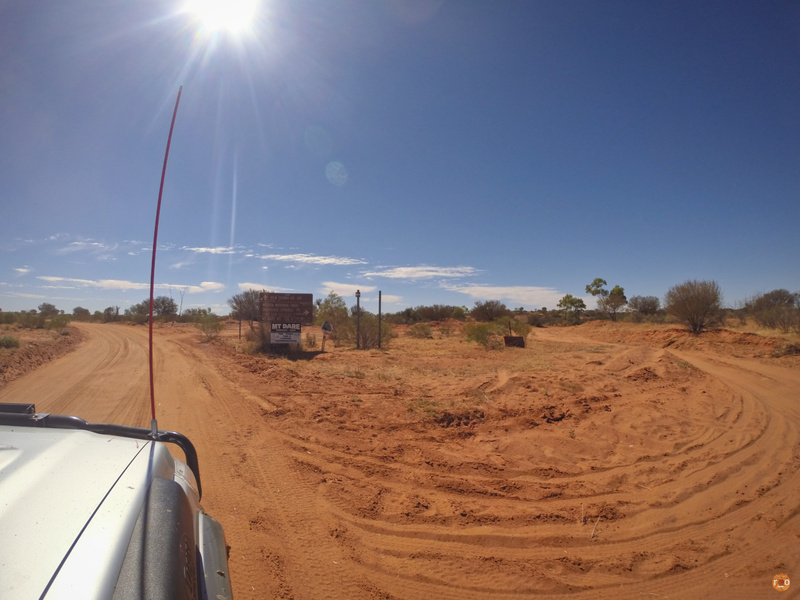 Paying for a camp, and snacks we retreated back to the LandCruiser and weaved our way behind the Hotel to claim a spot. Moving slowly, unfolding the Oztent. Although I was still deafened from tinnitus, small finches tweeting in the shrubs were slowly making themselves heard. Raised fire pits offer warmth if you have the wood to burn. At the recommendation of the proprietor, we had a shower whilst the solar warmth still lasted. Sitting about camp, watching the sunset, feeling the slow, stillness of the remote sink in. Washed, and recharged we eventually returned to the Hotel for dinner. 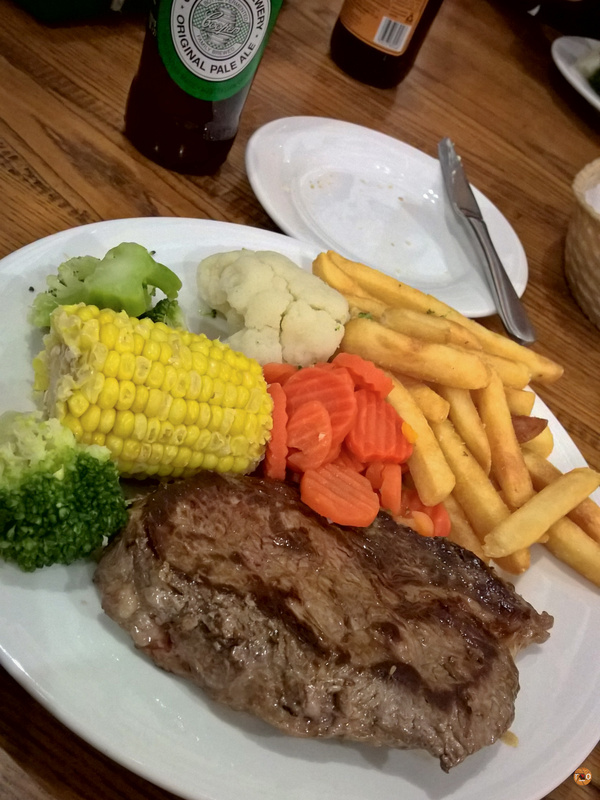 Garlic bread, huge steaks, vegetables and chips devoured, we chatted with the staff some more before a carload of visitors arrived. Their vehicle was a beat up old Commodore. 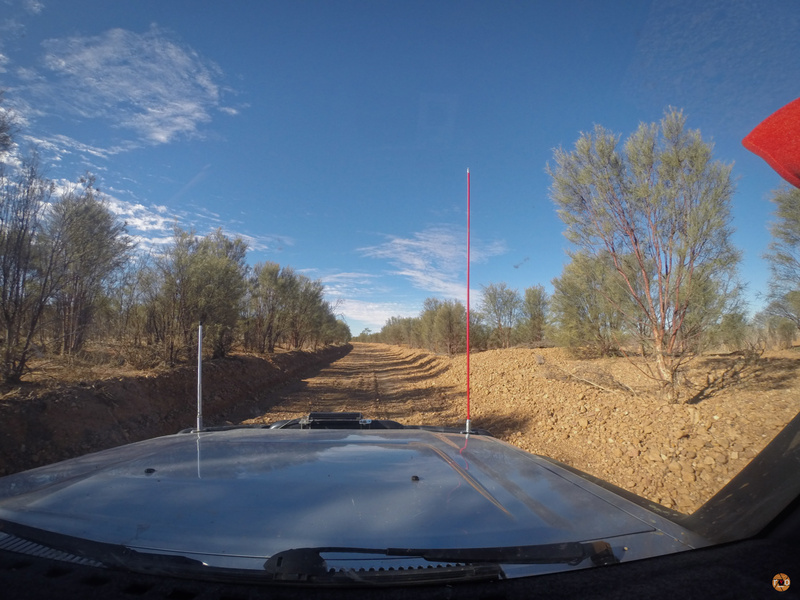 Our thoughts about rattling our way around in the LandCruiser in this rough terrain were laughed away. They left shortly after, supplies in hand. The day claimed its toll and we retired to bed. A group arrived and setup, we could hear their conversation in the stillness. They had visited Dalhousie Springs and were trying to fix a cracked wheel, ahead of Old Andado tomorrow. Their excited chatter only kept me awake for a short while however. Rising early, we excitedly packed and rolled back to the Hotel for bacon, egg and cheese sandwiches, and fuel, lots of fuel. We had two jerry cans to fill, and our 166litres Long Ranger tank. With a photo, and best wishes from our host, we set off, back out the way we came in. Before veering into the sun’s glare. The clouds as high as our hopes. 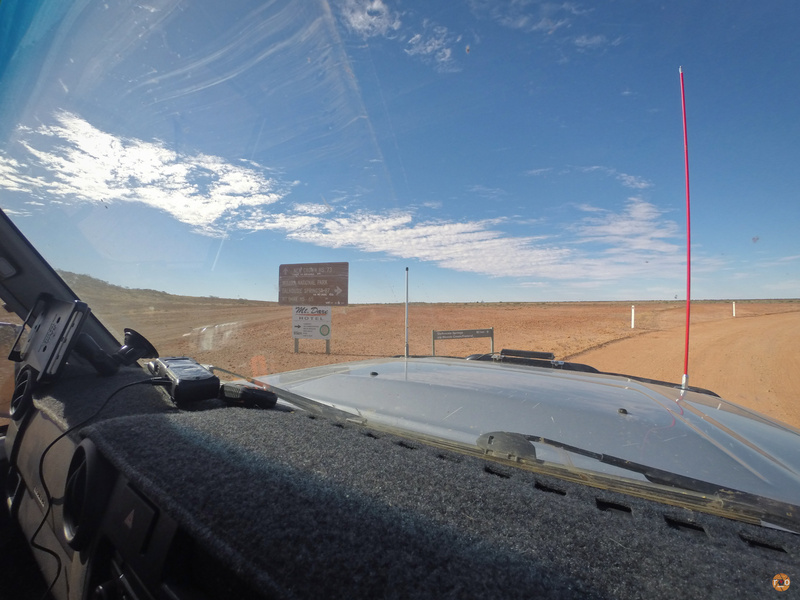 The unknown, untravelled expanse of the Simpson Desert awaited us.